Amie Beckwith, license #17152, graduated from East West College in 2010. In addition to this nationally accredited schooling, mentoring with amazing teachers, and years practicing and delving into the mind/body connection, she has also herself experienced a Traumatic Brain Injury and subsequent severe health crisis. Her education was expanded by this transformative experience, and the search for answers, medical and otherwise. When not working with bones, muscle, fascia, and electricity Amie is a mother, a writer, student of things hidden, collector of things forgotten. Allison Maki, license #24197, is a graduate of the East West College of the Healing Arts. 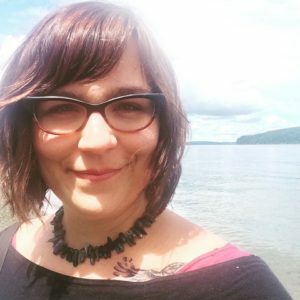 Coming from a background in social work, her approach to massage is guided by deep compassion for the human experience and an understanding of the importance of therapeutic resources in healing and growth. Her massage practice aims to facilitate personalized healing for each individual using tools such as deep tissue, myofascial release, craniosacral, trigger point therapy, relaxation techniques, and trauma-informed care. When Alley isn’t practicing massage she is often found lost in a book, biking around Portland, identifying plants, or spending time with her beloved dog Jeff. Olivia-Dominique Tunai, License #23875, is an alumni of University of Western States in Portland, OR and a member of the American Massage Therapy Association. For the past 8 years she has worked in the medical field and was inspired to be more involved in helping patients relieve pain in a more holistic way. Dominique uses a combination of myofascial release technique, trigger point therapy, muscle energy technique, deep tissue and cupping to get results. Her goal is to customize every session to her client’s specific needs. She is also trained in sports and pregnancy massage. In her downtime, she enjoys paddle boarding, hiking, volunteering and spending time with her nieces and nephews. She is currently learning Spanish and how to play the ukulele. Frances Carter, license # 21795, is a graduate of East West College of the Healing Arts and is a member of Associated Bodywork and Massage Professionals. Franci was lead to massage by a passion for holistic health, balance in her work life, and a desire to help others on their journey in wellness. She endeavors to create a safe space for each client, tailoring each session to their specific goals and needs. Franci uses her training in Deep Tissue and Structural bodywork in her practice, inviting the body into a state of relaxation and ease through fascial release. Training in Thai and Shiatsu modalities influence her work as well. Franci is also trained in pregnancy and post-natal massage and enjoys working with women of all ages and stages of life. In her free time, Franci is a busy mama to three fantastic kiddos and can usually be found at a park or the zoo, or occasionally enjoying uninterrupted quiet with her wonderful husband. Jasmine Blue, license #19707 is a graduate of East West College of the Healing Arts in Portland, Oregon and is a professional member of Associated Massage and Bodywork professionals. Jasmine has experience applying her skills as a massage therapist in a variety of settings and enjoys working with a diverse clientele. She listens to the body and invites change through deep relaxation and focused work. She loves helping athletes meet their training and recovery goals as well as working with prenatal clients, artists, caregivers, teens, performers and super stressed out folks. Whatever story your body has to tell, she is here to listen and help bring it closer to your ideal! Samantha Paquette, License #22341, is a graduate of East West College of the Healing Arts in Portland, OR and is a member of Associated Bodywork and Massage Professionals. Samantha found her path to massage therapy through a combination of working in the service industry for over a decade and through her work as a doula. She has a passion for working with repetitive motion injuries or pain that affects daily life. She also enjoys working with women’s health issues no matter where they are in their fertility journey, holding space for whatever you need at the time. She also has experience working with essential oils and giving guidance for adding pieces of self-care into a busy schedule. In her free time, Samantha loves taking trips to the Oregon coast, knitting, cooking, and spending time curled up on the couch at home with her loving fiance watching Netflix. Rachel Pincetich, license #17150, is a Massage Therapist and the proud owner of Portland Massage LLC. She is a graduate of the East West College of the Healing Arts in Portland, Oregon and a member of the American Massage Therapy Association. Through her previous experiences as a hospice volunteer, Rachel has discovered a reverence for working with the aging and hospice populations as well as those facing serious illnesses. You’ll often find Rachel in the office completing all the necessary administration tasks to keep Portland Massage thriving. In the treatment room, she uses both her education in massage therapies and intuition to give each client a unique and personalized session. She strives to make the massage relaxing and enjoyable while providing long-term results for the client. In her spare time Rachel enjoys taking her dogs for a walk, going to yoga, and traveling. She is married with three amazing children and lives in Southeast Portland not far from the home she grew up in.